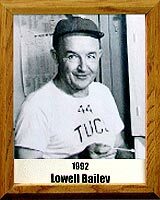 Lowell C. “Tedd” Bailey came to the University of Arizona from Ohio State in 1981 and became a catcher for “Pop” Mckale. It was while hunkered down behind the plate that her earned the moniker “Teddy Bear,” a nickname that was later shortened to “Tedd” and which he proudly wore for the rest of his life. Tedd’s accomplishments were many. Tedd’s dedication to the youth of Tucson, especially young-Mexican-American boys, was legendary. Along with “Porky” Patten, Bill Westerveld and Jerry Hauck, he organized the first after-school program for 16 years. Because there was no money for letters, Tedd bought the material and his wife Marie hand-stitched every one. If you happen to be one of Tedd’s “boys” who still has one of those special letters, cherish it. It was born of much love.